Update: Use my link to receive $10 off your purchase of a TooFerOne Leash! 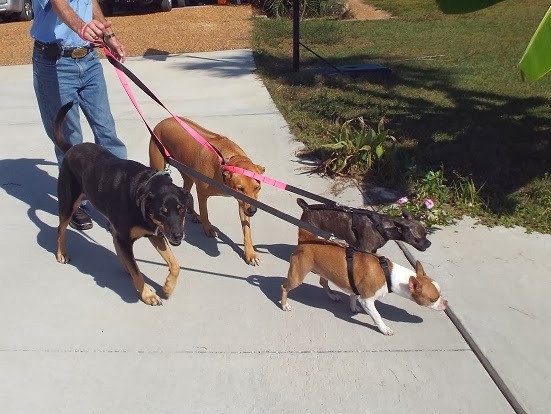 How many dogs can your leash walk at once? 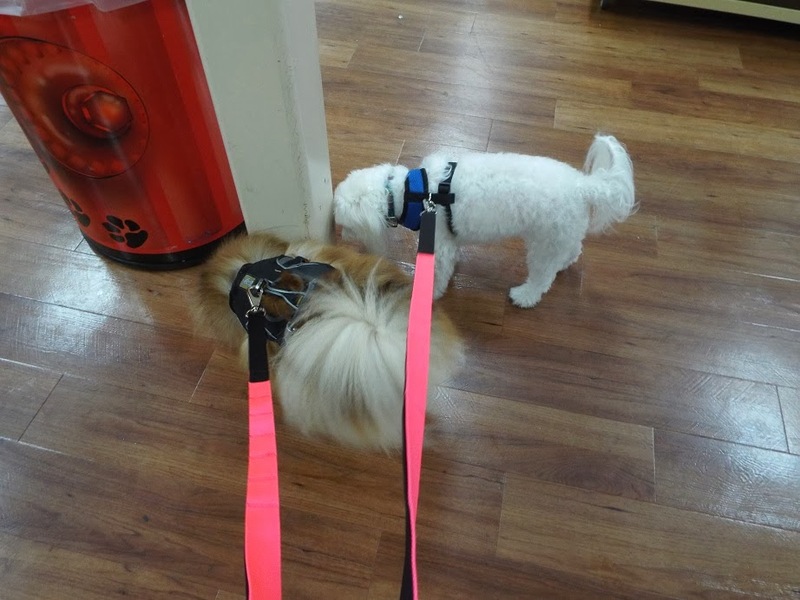 My new TooFerOne leash can walk as many dogs as I can find! BOL! 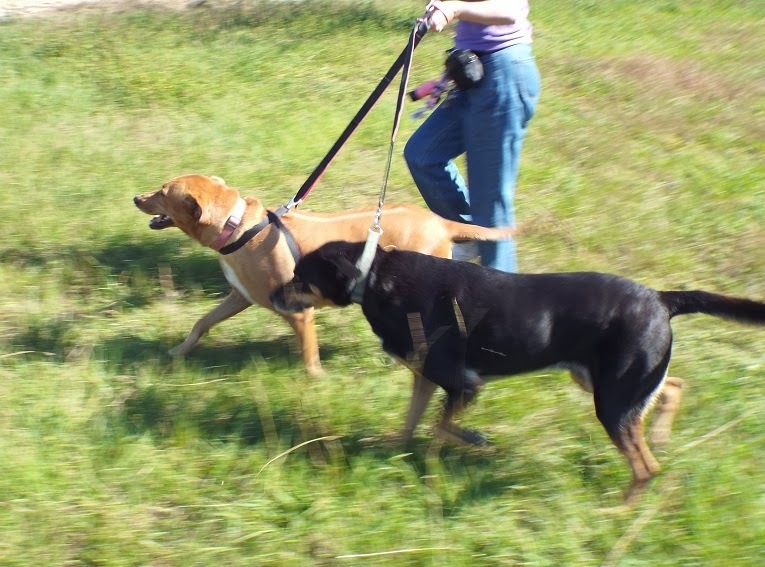 The TooFerOne leash has a clasp on each end, and several loops along the entire leash. 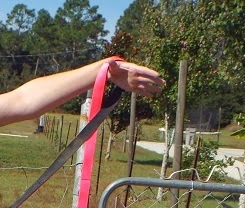 The loops can be used to slip one end through to make a handle, hands free around the waist, or double dog tie out. 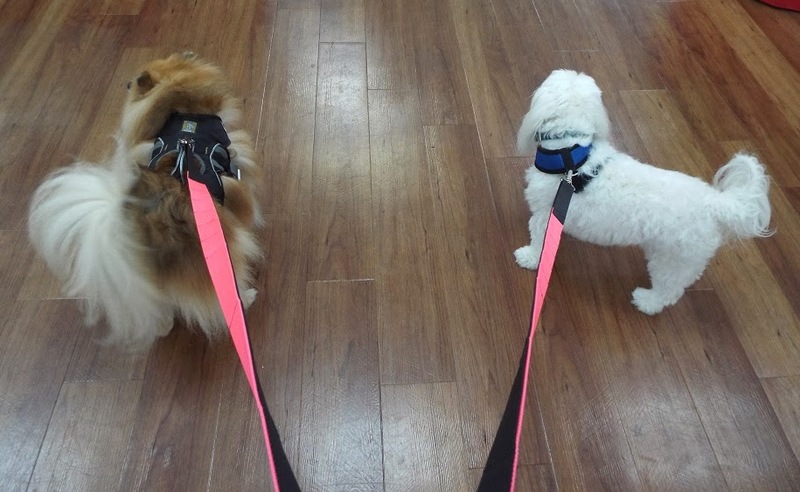 To walk more than 2 dogs, just add carabiners! 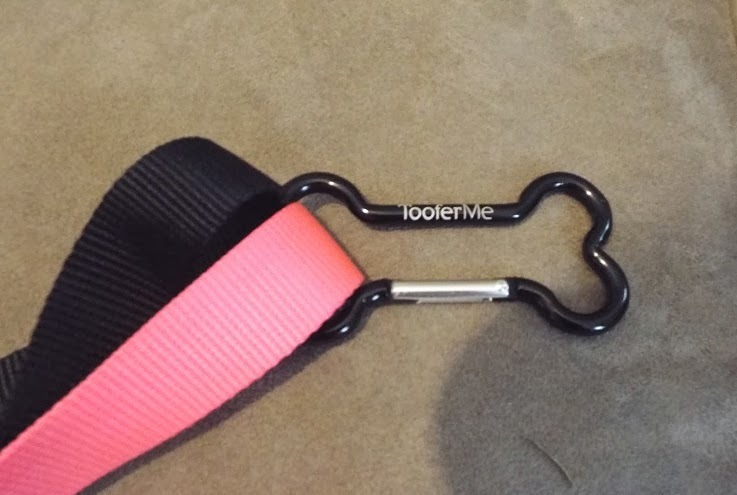 My TooFerOne leash came with this cute bone shaped carabiner. Mom can walk 3 dogs without buying more carabiners. She just needs to buy more caribiners if she wants to want to walk more dogs. Simply hook a carabiner through any of the TooFerOne loops and attach it to the new dog's harness or collar. Mom is a big fan of hands free leashes, so she wraps the TooFerOne leash around her waist like a belt, and slips one end though a loop. She hooks one of the loops to her belt with a carabiner to prevent it from loosening enough to fall off her waist. She also hooks a poop bag dispenser to a loop. She can hook the spare end to a carabiner when she is only walking one dog. In this photo only Baron is attached to the TooFerOne leash. Mom has both Baron and I hooked up to the TooFerOne leash in this photo. She still has it wrapped around her waist. 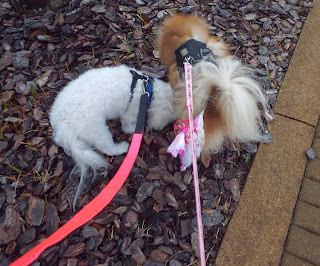 The TooFerOne leash is 10 feet long, so there is plenty of length for both of us when we share it. You can slip one end through a loop to make a handle if you don't want to wear it like a belt. You just let the circle slip smaller than when you make a belt. 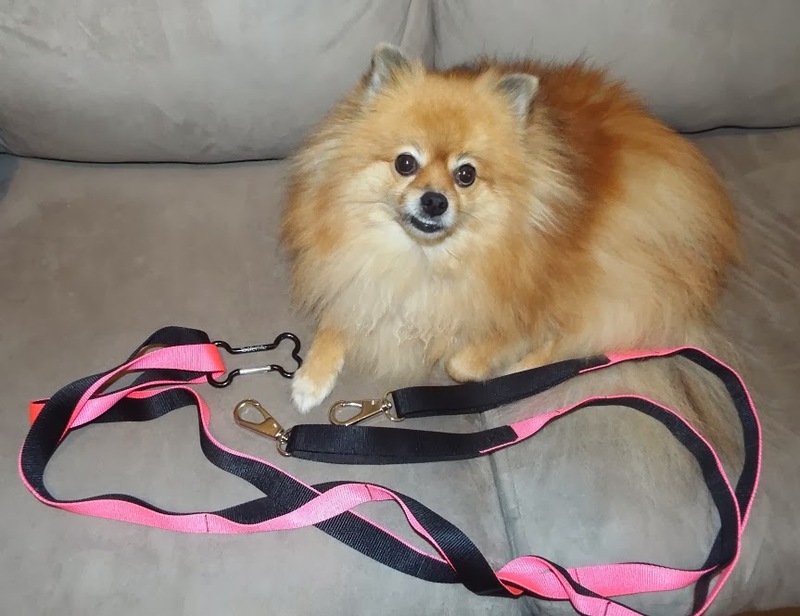 You can also make a harness out of the TooFerOne leash. Mom looped it around Lily (brown dog) in a figure 8 harness shape, then hooked the other end to Blue's collar. There is a video showing how to make a harness on the TooFerMe YouTube channel. There are other instructional videos on the TooFerMe YouTube channel that demonstrate several other ways to use the TooFerOne leash. Here are my 4 cousins walking together on the TooFerOne leash. 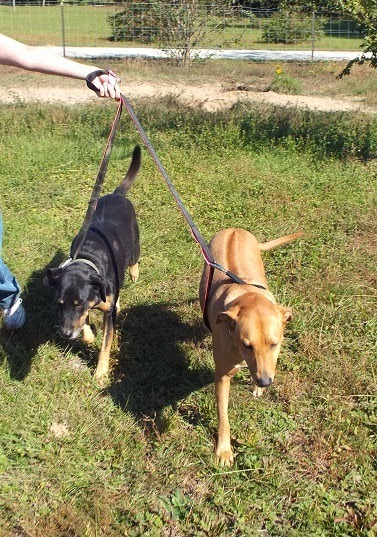 Lily (Rhodesian Ridgeback) is the only one with any obedience training. 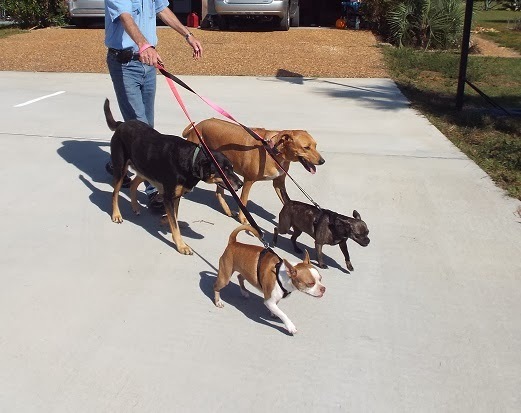 This is the first time any of them have been attached to the same leash. Amanda and Bailey, the 2 small ones, are attached with the clasps on the ends. Lily and Blue are attached to loops with carabiners. Does this photo remind anyone else of reindeer and a sleigh? BOL!! A TooFerOne leash would be a pawsome stocking stuffer for the dog lovers on your holiday list. 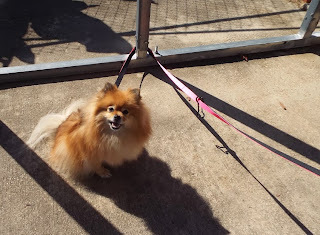 Mom can also use the TooFerOne leash as a tie-out for me when we visit my cousins. Their yard isn't completely fenced. I am not allowed to roam loose when we visit, but I get tired of being in the camper trailer all day long. Mom can attach me to the rail and leave the door open to watch me through the screen door. Of course I wrap it around a pole, it is more fun that way. BOL! Hey Mom! I am ready to come back inside now. The TooFerOne leash is now the first leash Mom grabs when we dog-sit, or visit either Baron or the cousins. 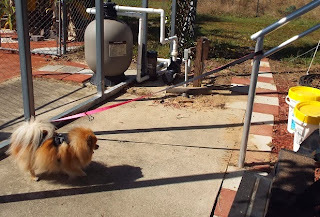 How many different ways can you think of to use the use the TooFerOne leash? I think TooFerMe has thought of at least a dozen different ways to use one TooFerOne leash! Review Disclosure: I did not receive any monetary compensation for this review. I do not receive commission from the coupon link. I was given a free product to review. The opinions in this review are my own and not influenced by any outsider . I receive no additional benefits for talking about the product or company. what a super idea. I LOVE IT! What a clever leash! Mommy gets all excited about stuff like that fur some reason! She thinks it would be especially handy fur tie-outs, because she could make the loop as big as or little as she needed. It could go around a whole tree! BOL!!! I hear you, it's one reason Mom's dad held the leash when there were 4 dogs on it. Mom didn't know if they would try to pull her down the driveway. BOL!! This is a very great idea! I love it! Pawfect for when you only have so many hands, and multiple pups. It is also great to rescue any lost pups you come across. Pookah I thought the same thing with the leash being long enough we exchange sides we would get tangled but what a neat idea that mommy can wrap around her waist as a belt instead of holding it in her hand. 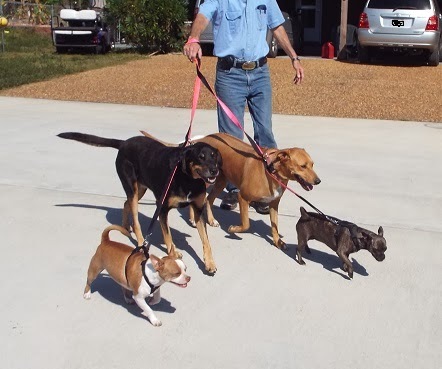 That is great for people that have all those dogs they pretty well stay in line. Great blog Pepper and great pictures. BOL!! 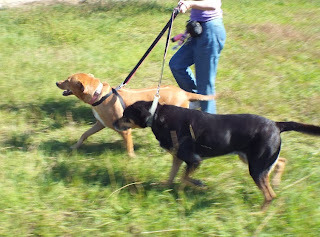 Baron and I tried at first, then Mom used one hand to separate us when we tried to cross. No more problems since Mom figured that out. BOL! Well, when you have more than one dog that would be the perfect leash, Pepper! I like that your mom can make it a hands free leash too! I see they have PINK...I wonder if they have orange. BOL Great review...and so nice to see your cousins in a post! ma says Lily is beautiful.